As you noticed, the “cheese grater” has not disappeared from the front of 415 First Ave. W.
The fabled “cheese grater” on Albany’s First Avenue — a sign of progress in the 1960s and now considered an architectural atrocity — is staying up there, at least for now. Last summer it looked as though the historic façade at 415 First Ave. W., hidden behind that aluminum addition for more than half a century, would once again see the light of day. But it has not happened and likely won’t any time soon. 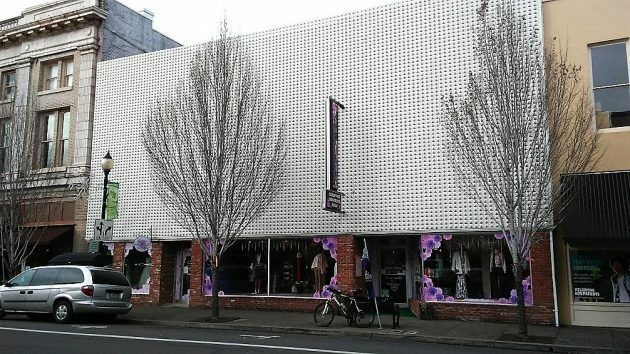 In July the tenant, Mercy House International, announced plans to buy the building and renovate the storefront at a cost then estimated at $320,000. This would include restoring the original arched windows on the second floor, which were covered up by the metal wall when the address housed an appliance store in the 1960s. The window job was going to cost around $62,000, and Mercy House asked for $10,000 from CARA, the Central Albany Revitalization Area, toward that expense. CARA approved the grant on July 18. But plans have changed, I learned this week. The building dates from 1866 and is one of the oldest downtown. The now vacant and unused upstairs is said to have housed a speak-easy during Prohibition. And as I understand it, the estimated cost of renovating the structure and bringing it up to modern requirements proved far too great. So Mercy House has dropped the plan to raise money to buy the property and fix it up. Mercy House says it helps women recover from the effects of spousal abuse. To raise money for its programs, it runs a business on the ground floor, a boutique named “1st Hand Seconds.” The manager, Colleen Anderson, was not free to go into the details when I talked to her Thursday, but she confirmed that the organization had dropped its plans at that address. Well, I don’t blame Mercy House at all, since it is too expensive to buy the building and to restore it. It is working for them the way it is. It makes sense Mercy House needs to use their funds for their cause and not buy the building but it would be nice if the current owner removed the “cheese grater”. That would not only look better but make the vacant upstairs more desirable to potential tenants. local gov’t spending should not chase the fashion fads with taxpayer monies. All of these comments are very valid, but the building is deteriorating, so is not working for us the way it is! We will be moving to a new location to further our ministry in the near future. Thanks to all of our committed shoppers and donations we will be able to do this. Our 7th Annual Gala and Fundraiser is February 1, 2019 at North Albany Community Church. Get your tickets now while they are available at the boutique. We will update you the end of February about our new boutique location. I kind of like the “Cheese Grater”. I don’t see the filthy, decrepit adjacent buildings as more attractive. I agree with Bill. The cheese grater ain’t that cheesy. I’ll bite, what do you consider “cheesy” with regards to architecture? Pardon my intrusion; I can’t resist offering an answer. One example of “cheesy” is what happened throughout most of the country starting around 1986 and continuing unabated. Build bigger boxes and paste on their most-visible sides every sort of neo-classical, neo-traditional, symbolic, cutesy, pretentious, “post-modern” junk. Forget about form, function, siting, and individual desires, and just randomly pick stuff from a style book. Besides, who needs function when the new owner is probably going to sell within a few years? The safest bet is to build stuff that “everybody” likes. Computer-aided profit maximization. The cheese grater front can probably be sold especially if it is aluminum. The mid century style that is so in right now would probably gobble this up. Architects might be interested in incorporating it in remodels or new fresh designs. Maybe the money made from selling it can help finance its removal and some window repair.